The recycling materials gathered at curbside in the Township are delivered to, and processed by Penn Waste. The use of Penn Waste’s single stream recycling facility allows you to place all of your recyclables in one container for collection. No sorting is needed. Check the weather. If the weather forecast calls for high winds or rain, keep your recycling inside until the following week, if possible. Wet paper is more difficult to process. Place your bin out the evening before the scheduled pickup day. Ensure any loose paper or light cardboard is covered with heavier materials. This will help ensure your materials do not blow out of the bin. Bundle any large or loose pieces of cardboard that will not fit inside your recycling bin. Collect your recycling container as soon as possible after pickup to prevent it from blowing away. Below is an overview, provided by the Lancaster County Solid Waste management Authority of the materials that may be recycled. 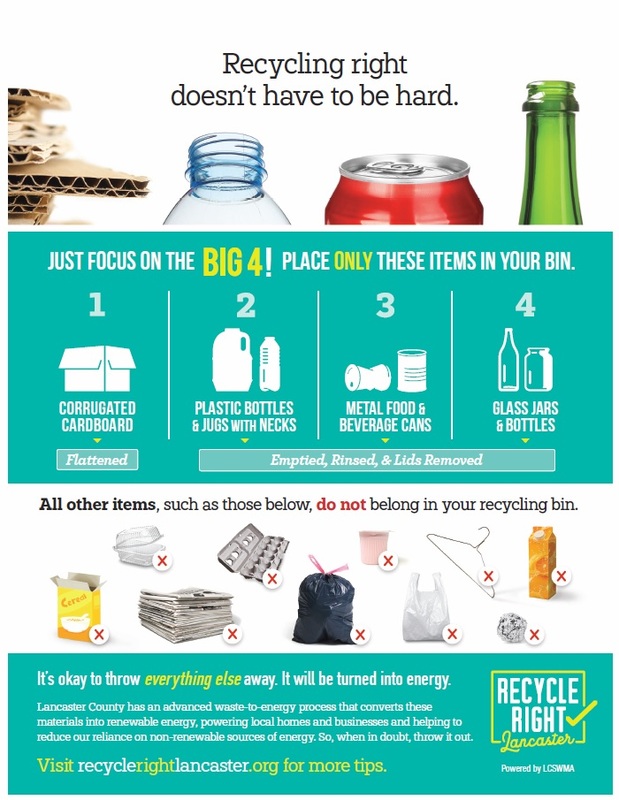 These steps help ensure that your recycling efforts are contributing to a greener future.